This soup is adapted (ever so slightly) from a favorite soup-oriented cookbook—Anna Thomas’ Love Soup. If you don’t have turnips, substitute a slightly larger squash, more celery root or a few carrots. Celery root is the gnarly subterranean root of the common celery plant. It’s an overlooked treasure—loaded with vibrant celery flavor and a nice crunch. You’ll enjoy it raw as well as cooked—shave some into a green salad for a change of pace. This salad is simple, yet the flavors go far beyond ordinary, everyday tossed greens. 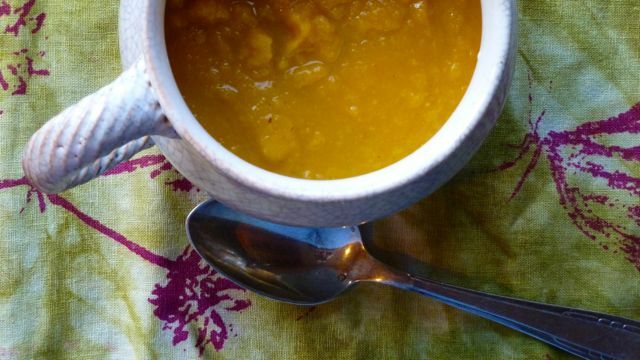 Substitute any type of winter squash (some will need peeling, depending on the thickness of the skin). We love arugula in this salad but choose your favorite assertive greens: escarole, endive or Japanese mizuna. 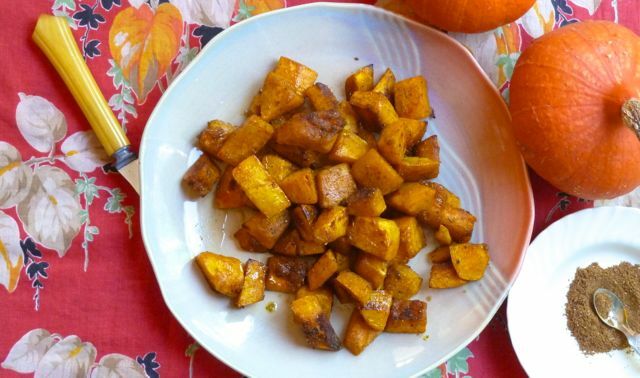 This dish is inspired by a traditional Indian pumpkin preparation in which the vegetable is sautéed with spices then lightly sweetened with sugar. In this Indo-American version cubed squash is sprinkled with fragrant garam masala (a ground spice blend that includes cinnamon, cloves, cumin and cardamom) and roasted in the oven. Before serving it’s drizzled with maple syrup and a squeeze of fresh lemon juice. This versatile vegetarian dish serves equally well as a main course or a hearty accompaniment. Substitute whatever produce you have on hand — zucchini, eggplant, cherry tomatoes and peppers in the summer or carrots, parsnips, fennel, broccoli, cauliflower and winter squash in colder months. Whatever vegetables you choose, the flavor is sure to be deep, complex and oh so good. Roasting takes any ordinary veggie and intensifies the flavors, delivering taste that’s utter magic. Farro is an ancient wheat grain from Italy. It has a chewy, soft texture and nutty flavor when cooked. It’s worth seeking out — you’ll find it at Whole Foods and other quality markets. 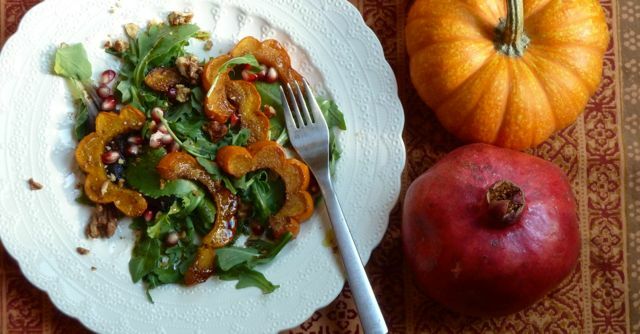 Winter squash and greens create a winning combination — vibrant colors, soft textures and deep flavors. Choose pasta like oreccheitte (little ears in Italian), fusilli (little spindles) or gigli (lilies) that catch bits of the smooth vegetables in their nooks and crannies. Preheat oven to 400 ° F. Toss squash and onions with enough olive oil to coat. Roast until tender, about 35 minutes. Turn once during cooking. Roughly chop chard leaves. Heat some oil in a large skillet over medium heat. Add chard, garlic and a pinch of red pepper flakes. Cook until greens are wilted and tender. Turn off heat. About halfway through roasting cycle, bring a large pot of water to boil. Add pasta and a large pinch of salt. Cook al dente, then drain. Place roasted vegetable into skillet. Add pasta. Toss ingredients together, adding some extra virgin olive oil to moisten. Place in a serving dish and sprinkle with walnuts and cheese.